Home/Blogs/This is going to be a great party! Just because the summer is over doesn’t mean you have to go into hibernation until next spring; you can continue those fun and popular social gatherings right through that not-so-friendly winter weather. But while everyone is ranting about “man caves” you would like to set up a room or area of your home for entertaining that doesn’t involve neon beer can “art” and barn-sized televisions. So, where to begin? The cornerstone of all entertainment: the bar. Having a bar area says “This is going to be a great party” as soon as your guests walk through the door. It’s also convenient for the host or hostess; no more scurrying to the kitchen to rev up the blender or find a bottle opener. You can stay engaged and engaging all evening long with everything you need right at hand. There is a huge variety of bar options available; casual “belly up to the” bars; elegant “member’s only” bars; bars you can close up and lock away when you leave your teenager home for the evening ; bars that turn into innocent consoles when the pastor drops in unexpectedly for a visit. 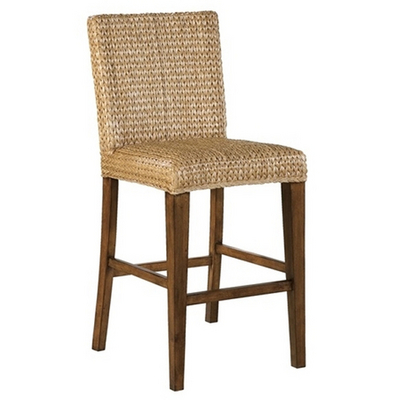 You can further set the mood with your choice of barstools. If you want to preserve some of that “fun in the sun” atmosphere, consider a barstool like a lovely rattan design or this trendy sea grass barstool. Go space-age with a molded plastic stool or light-hearted and fun with this design by Michael Godard. Keep your entertaining area looking upper crust with a traditional barstool like the leather seated “Giovanni” or the elegant Frederico. 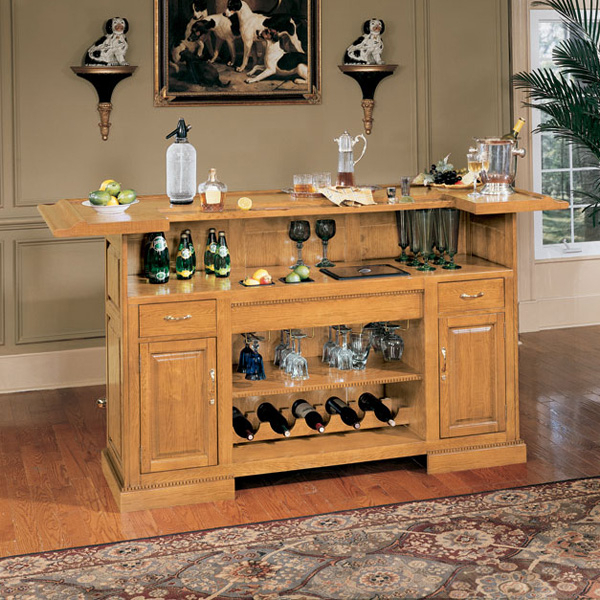 Keep the bar area from going man-cave with a barstool like this nod to provincial French design. Make sure you have appropriate glassware; if you make a mean martini, have martini glasses to serve them in; James Bond would never drink out of a red plastic cup. There are lots of new wine glasses out there; stemless and double-walled glasses are hot to keep those beverages cold. Beer has become an art form with the plethora of micro-breweries and specialty beers around; if you are big on pilsner or are serving Dos Equis, there’s a glass for that. Consider adding a bartender bible to stash behind the bar; You will be very popular if you can whip up a “Bourbon Daisy” or a “Jillionaire” on request; these books also provide a list of spirits to keep stocked in a home bar, advice on garnishes, and alcohol quality reviews as well. 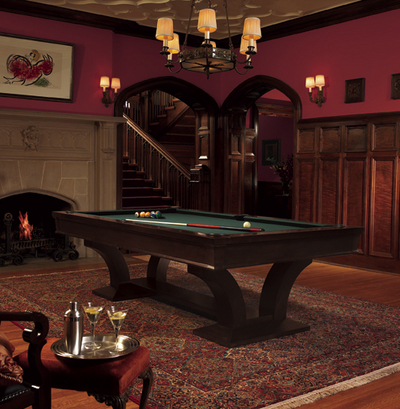 You may want to leave the pool table to the man cave, but if not, there are many beautifully designed pool and billiard tables that can add to your entertainment quotient. There are contemporary, classic, and casual designs. Or maybe you prefer a game table instead; a lovely night of bridge or a boisterous all-night poker tournament will go better at one of these versatile tables. There are various seating options and some of the tables are convertible so you can drag out Monopoly and have some board game fun as well. If you haven’t tried it, I recommend “Cards Against Humanity: A Party Game for Horrible People” – definitely not for a family gathering, but a lot of fun with friends. As for the rest of the room; rule of thumb: choose light or bright colors to create a more casual atmosphere; rich jewel tones or neutrals to keep the area more conventional and subdued. Proper lighting makes a huge difference; there are as many lighting options as there are beer and wine varieties. A chandelier adds a formal touch to a room; table lamps preserve intimacy; track lighting is trendy and contemporary. So summer is over; bring the party indoors. With the right bar, barstools and the proper equipment, you are well on your way to becoming the host or hostess with the most or mostess.